Two years after the original Conspiracy, the sequel is here and it looks badass. I’m super stoked to draft a bunch of it, and add some new sweet cards to all sorts of decks. From a finance standpoint, I want to make something clear: While Kaya, Ghost Assassin took out Brago, King Eternal in the storyline, Conspiracy: Take the Crown is going to assassinate prices. Here’s the current prices for the original Conspiracy. Plus, if you’re into that sort of thing, here’s the foils. Looking at these two lists, I want to bring up some data points that will inform my purchases for Take the Crown. First of all, some of those foil multipliers are outlandish. Dack Fayden’s foil is thirteen times more expensive, and that’s even after being in Eternal Masters! Dack is one of the most powerful cards in Vintage and in Cube, so his price isn’t too shocking. Marchesa, the Black Rose is more than ten times as pricey in foil. Scourge of the Throne is big, as are lots of others. This tells me that the casual demand is pretty high for these cards, or in some cases, the Legacy/Vintage demand. I do expect the foil demand to be high again for Take the Crown, and mostly, I’ll be going after foils for myself and for long-term value. Note that the value of Conspiracy foils have stayed pretty stable since about January 2015, so I don’t want to get foils right freaking now OMG shiny!! I do want to get them before Christmas. Generally speaking, the time to get cards in one set is after the next set has come out. 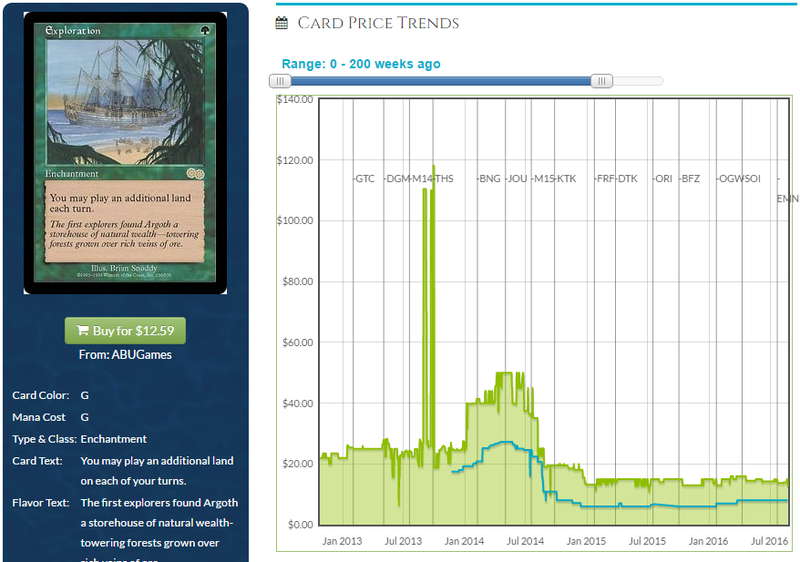 Note the dip around the time before/during Khans of Tarkir being released. The card was $50, and has stayed stable at $10-$15. This has all the ingredients of a card that should be $50 or so. It’s a four-of in a powerful and effective Legacy deck (Lands) and only has two printings. But because one of them is a modern-day supplemental set, the price is quite reasonable. This loss of 75% of value is repeated elsewhere in the set. Misdirecton went from $30 to $5. Mirari’s Wake dived by half. Hydra Omnivore went from $15 to $3. And so on. I’m going to treat Take the Crown as something that’s going to be printed a lot, and opened a lot. This has a lot of valuable cards, at a regular booster’s price. You cannot expect a Modern Masters-type effect here, you can only expect prices to take a bath. A big one. With that in mind, here’s my list of things you need to trade away right now, send out via Pucatrade, whatever the case may be. These are going to fall and fall hard. I’m focusing today’s picks on the nonfoils, and I’ll be interested in seeing how the foil prices fluctuate. Ghostly Prison – How much do we love these effects? This has been printed three times, plus a FNM promo, and still it’s this high. Granted, those three printings were Champions of Kamigawa, Commander 2011, and Planechase 2012, which are all three possibly not going to add up to the number of these that will be put into circulation. These will be lucky to keep half their value and likely end up in the $3 range. Hallowed Burial – About to be a dollar rare. Pariah – Buckle up, because you’re headed for the bulk bin. Desertion – $6 for a foil or $9 for the Commander’s Arsenal version. Either way, this will hit $2 and stay there for a while. It’s an awesome spell and has long-term potential, but the market is about to be flooded. Kami of the Crescent Moon – Smug little smile, less than a dollar in price. Serum Visions – This might stay at $1.50, but that’s the highest. Again, we are about to get a big influx. Show and Tell – This was $80 before the announcement. It’s not done falling, not nearly. I suspect that $30 is reasonable and $20 is in play. I don’t know if it has enough Commander appeal to soak up extra copies. Side note: I like picking up Griselbrand and Omniscience as the best things to put into play. More Show and Tell cards may lead to more Show and Tell decks. Inquisition of Kozilek – Possibly the banner card for reprinting, It’s already down to $10 and I will be surprised if it stays above $5. I think two or three bucks. Phyrexian Arena – Six printings, and three of those had foils too! It’s just so good in just about any deck, though it’s too slow for Modern or Legacy. The casual crowd is going to soak up a lot of these, and when it’s down to $2 or so, I’m going to start buying them. Burning Wish – The demand for this card just isn’t very high. I think this struggles to stay above $4. Gratuitous Violence – One of my all-time favorite cards, now destined to be bulk. People just don’t have the intestinal fortitude for this. Kiln Fiend – I look like a genius, because two weeks ago, I sent out a dozen of these on Puca from old draft boxes. This price was due to scarcity, and it will be at a quarter, maybe fifty cents. Beast Within – This has had a lot of supplementary printings, but those weren’t high volume. The volume of Take the Crown is going to be much higher, and it’s an uncommon, dropping it to a dollar or less. Birds of Paradise – Doesn’t matter how many you print. This is going to fall, and then creep up over time. Again. Notably, this hasn’t been printed at all since Magic 2012 five years ago. It’ll fall to $2-$3 and stay there for a long while. Berserk – Can you believe this is in the set? I still can’t. Printings are Alpha, Beta, Unlimited, FTV:Exiled, and now this. That is a tiny, tiny supply, and I suspect that a lot of Commander games are about to be ended by using this on someone else’s creature. I think the market gets pretty flooded, and this stabilizes around $25 in two weeks, but it could go lower. Burgeoning – Exactly the path of Exploration. Huge hit to its value, likely to sub-$5. Forgotten Ancient – We made this card! We will also see it hit bulk. Platinum Angel – This mythic has been resilient to reprints, and I’m reluctant to forecast too much of a hit. Down to the $5 range seems about right. Did I leave something off? Let me know in the comments or in the forums! This set is beyond depressing to me from a finance standpoint, it might be the tipping point for me to get out of Magic. It’s too expensive to play and getting too hard to make money. Jace was a $100 Standard card, Liliana is still $40+, Gideon $20+ etc. Hangarback went up to $20 and cratered, it’ll never see $10 again. In Modern if you find a broken deck it gets banned. And in Legacy if a new Blue card is too good, ie Cruise and Dig, it gets banned so there’s no money to be made there. What is one to do? Conspiracy 2 is great for casual or newer players…I guess. There’s more great Eternal cards than in Eternal Masters. But the Berserk reprint crushed me financially, I have to imagine the Show and Tell reprint hurt a lot of people’s pockets as well. As noted by you Cliff, the prices of the Conspiracy 2 cards are gong to plummet. If I was a dealer I would have had crazy presales and be tearing through boxes to sell off cards now. There’s going to be no value except for one or two mythics from the set in non-foil. Biggest lesson, that dude who bought out Moat and LED was right, if you want to invest in Magic cards make sure it’s on the Reserved List. 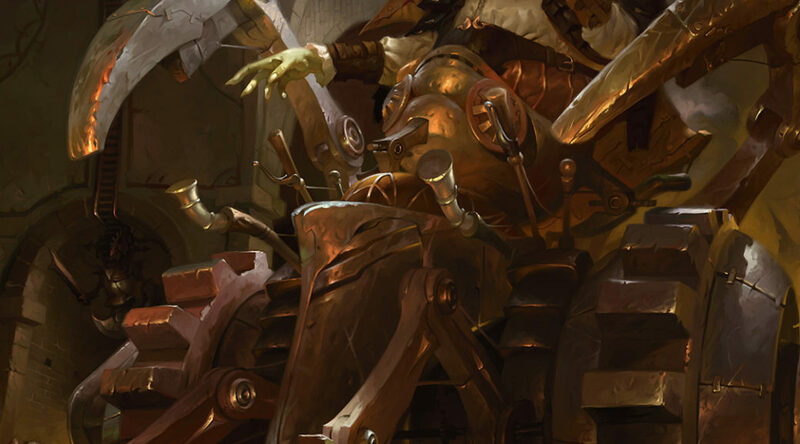 There’s no value to be found in new cards except a random foil of a mythic like Dack Faden or Jace Vryn’s Prodigy which is just like stumbling upon a winning lottery ticket. Good day(s) for the anti-finance community, bad day for the rest of us. PS – Has anyone checked the prices of Khans fetches recently? I know it’s the summer but I can NOT believe how low they are and this is Modern season. I agree Spencer, there is about to be a lot of feel bad out there for pre-existing show & tell and berserk owners. Granted most veterans of legacy or vintage are desperate for new players but it still doesn’t make you feel any better about watching $50+ in value per card evaporate overnight. The scary thing from a financial perspective is that WotC is now testing the waters w/ big reprints in unlimited print run sets. At least w/ the masters reprints there is a finite amount of supply entering the market. You know that bubble people were saying didn’t exist ? Yeah, this is it.